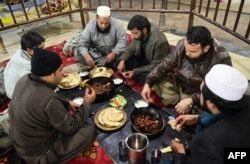 Pakistani customers eat grilled meat at the Charsi (Hashish) Tikka restaurant in Namak Mandi in Peshawar, Dec. 6, 2018. A Pakistani cook grills kebabs while customers look on at the Tory Kebab House in Namak Mandi in Peshawar, Dec. 13, 2018. 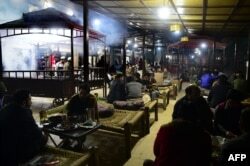 Pakistani patrons enjoy eating grilled meat cooked on a barbeque at the Charsi (Hashish) Tikka restaurant in Namak Mandi in Peshawar, Dec. 6, 2018.